We would like to thank The DoubleTree by Hilton of Naples for their valued partnership and efforts in supporting STARability’s Trailblazer Academy to #BringOutTheAbility, by providing vocational training for individuals with intellectual and developmental disabilities. This vocational training program provides our participants with valuable job skills as they work with hotel staff for various tasks such as; rolling guest towels, housekeeping, and the restaurant duties of rolling flatware. But our participants received much more than just vocational training at this partnership. They also have an opportunity to train while assisting the hotel in the “Clean the World” enterprise. This social enterprise program distributes recycled soap and hygiene products from over 5,000 hotel partners to countries that are at a greater risk for the spread of pneumonia and cholera, (two of the top causes of death for children under 5). 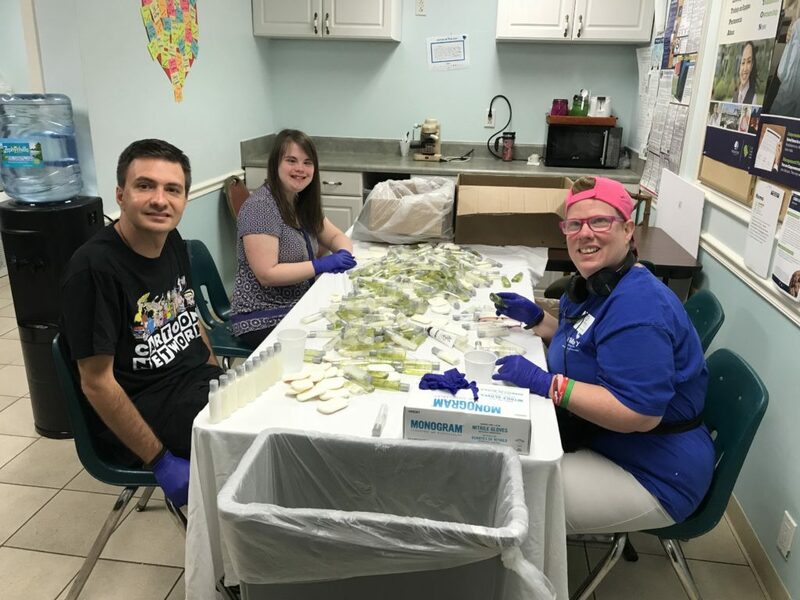 Our Trailblazer participants contributed to this cause by helping to organize and prepare recycled bars of soap, partially filled bottles of shampoo and conditioner and readying them for packaging and redistribution around the world. The Trailblazers are proud to be part of this important “ Clean the World” program with DoubleTree. A beneficial partnership—for our participants, our community and our world. STARability Foundation Trailblazer Academy is a community-based program that combines vocational training at various area businesses, employment readiness, independent living skills, academic education, health and fitness, and art enrichment experiences in an all-in-one curriculum. These opportunities for our participants would not be possible without the help and support of our amazing vocational partners. If you or someone you know has a business that would like to partner with our hard working Trailblazers, please contact our Trailblazer program director, Madison McNally at madison@starability.org or by calling 239-594-9007. ← Get ready to be dazzled at the Star Gala, “Dazzling Diamond Soirée” on March 9, 2019, a benefit event at The Ritz Carlton Golf Resort, Naples.